A group of students has started an online petition urging the government to reconsider its decision to withdraw from the Rome Statute of the International Criminal Court (ICC). The students say this is in the interest of seeking justice for victims of the downed MH17. The petition was started by the same group of students responsible for leaking an executive summary of a paper by four academics which they (the students) claimed was used to convince the Conference of Rulers to reject the Rome Statute. The students are Asheeq Ali Sethi Alivi, Ainina Sofia Adnan, Nurhuda Binti Ramli, Suhail Wan Azahar, Ahmad Taqiyuddin Shahriman, Wong Yan Ke, Chong Kar Yan, Nik Azura Nik Nasron and Siti Nurizzah Mohd Tazali. “Until now, the family members of all the MH17 passengers and crew have not had justice. MH17 was shot down using a Russian guided missile and when Malaysia tried to bring this matter up with the UN, it was vetoed and kicked out by the biggest power, Russia itself. “So who will provide justice for all the 298 lives lost [...]? The answer is the ICC. It has been five years now, so why have the criminals still not faced the ICC? “The answer is because Malaysia is not a signatory to the Rome Statute,” the petition read. 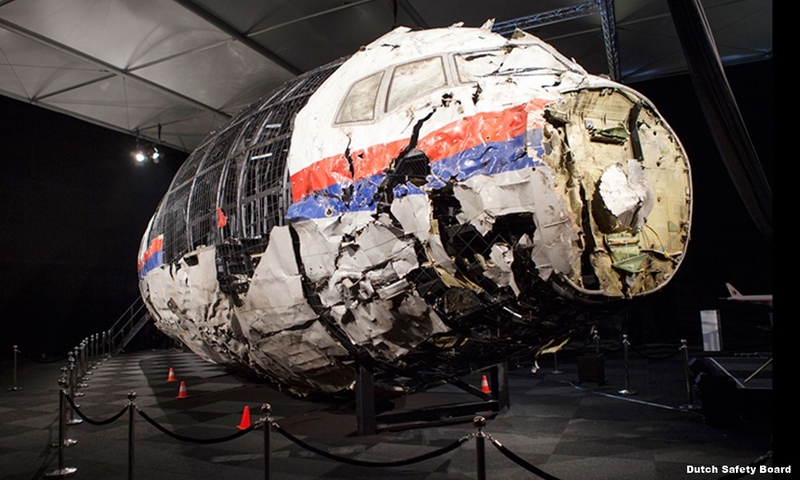 MH17 was shot down on July 17, 2014, as it travelled over eastern Ukraine while flying from Amsterdam to Kuala Lumpur. All 298 on board were killed. A Dutch-led joint investigation team eventually concluded the jetliner was brought down by a Russian missile which originated from a Russian military unit. The Russian government has denied responsibility. In 2015, it used its veto at the UN to block a draft resolution to set up an international tribunal. Russia withdrew its signature for the Rome Statute in 2016, but could still be subject to the ICC. At press time, the petition addressed to Prime Minister Dr Mahathir Mohamad has picked up over 3,100 signatures. The petition also added that Malaysians “need not fear” the Yang di-Pertuan Agong being brought before the ICC as Malaysia has no history of crimes against humanity. In the event such crimes take place, the king’s position is protected by the constitution as a constitutional monarch who acted in accordance with the advice of the prime minister or the cabinet. “We urge the Conference of Rulers and the government to give way so that the Rome Statute can be ratified by Malaysia. We also urge those with bad intentions to cease manipulating the ICC justice system. 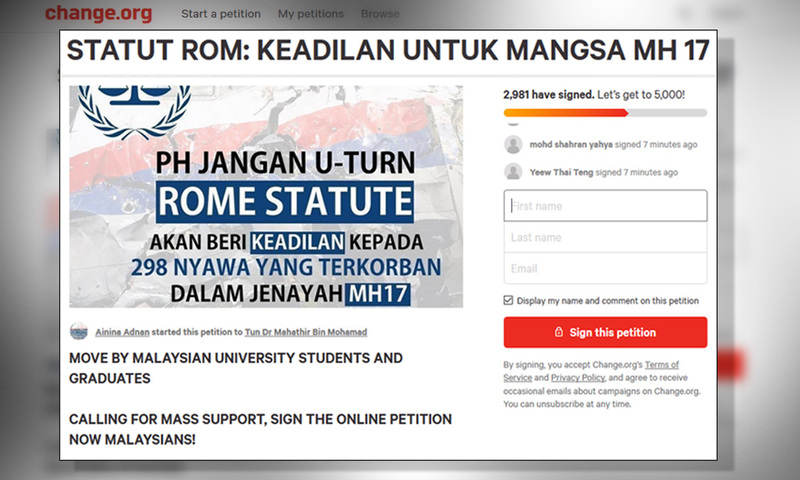 “We, nine youngsters, urge and plead with the Malaysian people to stand with us in fighting for justice for the victims of MH17 before more lives are victimised and sacrificed,” stated the students' petition. Malaysia initially acceded to the Rome Statute but this decision was overturned following protests by several quarters including the Johor royal family which claimed the statute contravened the Federal Constitution and would affect the monarchy, Malay rights and the sanctity of Islam. Putrajaya said these parties had been misled and there was a plot to overthrow the democratically-elected Pakatan Harapan government led by Mahathir.